Last summer, in the course of a campaign speech reaching out to pro-Israel groups concerned about his commitment to the Jewish state, then presidential candidate Barack Obama declared, "Jerusalem will remain the capital of Israel, and it must remain undivided." Those words, which he later qualified, may now be coming back to haunt the President as he seeks to restart the moribund Israeli-Palestinian peace process by getting Israel to freeze all construction outside its pre-1967 borders. Israeli Prime Minister Benjamin Netanyahu has drawn a line in the sand over Jerusalem, vehemently rejecting Washington's demand that he halt a construction project in the Arab eastern portion of the city that was occupied by Israel in 1967. Israel claims sovereignty over all of Jerusalem, and Netanyahu told his Cabinet on Sunday that this claim was nonnegotiable. Although the U.S. has routinely opposed Israeli construction in East Jerusalem  President Bush's Secretary of State Condoleezza Rice called it "unhelpful"  Netanyahu appears to be betting that by very publicly challenging Obama on Jerusalem, he can rally support from those Jewish leaders in the U.S. who have lately expressed disquiet over the President's Middle East policies, and also from Christian conservative supporters of Israel. And the Israelis are plainly looking to make a campaign of it, with the mayor of Jerusalem being dispatched to the U.S. to rally opposition to the Administration's position on the city. But finding a formula for sharing Jerusalem, the eastern part of which the Palestinians claim as their future capital, is fundamental to the peace process that Obama has sought to revive; there will be no Palestinian or Arab takers for any deal that leaves all of Jerusalem under Israeli control. So by picking the Holy City as the battleground for a test of wills with Obama, Netanyahu is mounting a broader challenge to the President's peace agenda. Israel seized control of the eastern portion of the Holy City during the war of 1967, but its claim to sovereignty over the occupied portion of Jerusalem has never been internationally recognized. Under the Oslo peace process launched in 1993, Jerusalem was defined as one of the "final status" issues to be negotiated in a peace agreement, but finding a solution for sharing the city has been one of the thorniest matters. 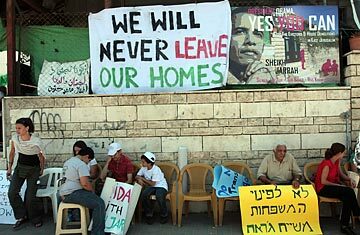 When Israeli Prime Minister Ehud Barak dared negotiate Jerusalem at Camp David in 2000, then Likud leader Ariel Sharon walked onto the city's Islamic holy sites to symbolically declare his party's determination to keep all of the city in Israeli hands. (Sharon's action touched off a riot that marked the beginning of the Second Intifadah.) Today's Likud leader, Netanyahu, and the party's coalition partners appear as determined as Sharon was to maintain Jerusalem as "Israel's eternal and undivided capital." Not that this should come as much of a surprise. Sharing Jerusalem may be one of the basic requirements of the two-state solution as developed over the past two decades, but Netanyahu has been a late and reluctant convert to the two-state formula  and even then, on terms many of his supporters acknowledge are unlikely to be acceptable to any Palestinian leader. And he has pushed back against Washington's demand for a freeze in settlement construction. The two sides remain locked in negotiations on the issue, with an already previously postponed meeting between Netanyahu and President Obama's Mideast peace envoy, Senator George Mitchell, postponed for a second time this week. Refusing to even discuss East Jerusalem's status raises the ante, providing further reason for skepticism among Arabs that Netanyahu is serious about a two-state solution. The Obama Administration has warned Israel not to proceed with a residential project in the Sheikh Jarrah neighborhood in East Jerusalem, noting that the U.S. views such construction in the same light as settlement expansion. But while the Netanyahu government may be willing to dismantle some of the settlement outposts built without permission in the West Bank (they're usually rebuilt by settlers within days), the Prime Minister made clear on Sunday that "Israel will not agree to edicts of this kind in East Jerusalem." Even though Obama is backed by a vast international consensus  the key European powers, Russia and the U.N. have all publicly supported the U.S. position  Netanyahu clearly believes he can force the President to back down. And in doing so, the Israeli leader has taken a position from which he'll find it difficult to retreat. Netanyahu will get strong political support within Israel for standing up to Washington on Jerusalem (as he has done by resisting pressure for a settlement freeze), and he expects that the more symbolically powerful issue of the Holy City will win him support in the U.S. from Jewish leaders and Christian conservatives. In introducing Netanyahu via a video link at the annual conference of his Christians United for Israel group, arch-conservative Pastor John Hagee promised the support of 50 million Christians for "Israel's sovereign right to grow and develop the settlements of Israel as you see fit and not yield to the pressure of the United States government." The problem facing Obama is that pressing for a two-state solution has put him at odds with a reluctant Israeli government that has now chosen the emotive issue of Jerusalem as the test of how far he's willing to go. If he backs down, Obama pulls the plug on his carefully crafted outreach to the Muslim world and can expect to see his effort to settle the Israeli-Palestinian conflict fail before it has practically begun. But pressing ahead on Jerusalem and the wider peace agenda of which it forms part could, like pushing his health-care plan, come at a rising political cost for the President. See pictures of Israeli soldiers sweeping into Gaza in 2008.